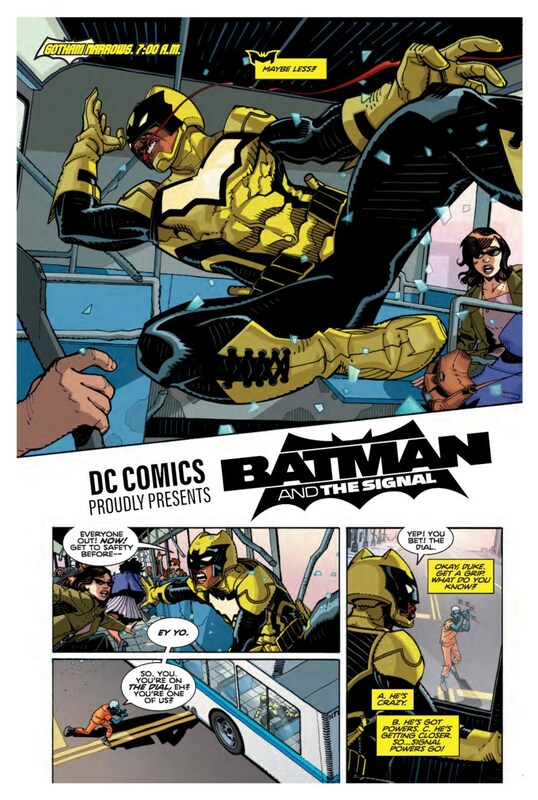 Posted on October 5, 2017 by thelostlighthouse	in Comics, Literature and tagged art, Batman, Batman White Knight, comic book review, comic books, DC comics, Literature, Matt Hollingsworth, Sean Gordon Murphy, The Joker, TLL. Batman is bad for Gotham City, he creates criminals, causes unquantifiable amounts of property damage and makes it so much more of a dangerous place. You may have come across some of these points before (see this Episode of Cracked After Hours if you need refresher: https://www.youtube.com/watch?v=Cd1sIwCLtIc ). 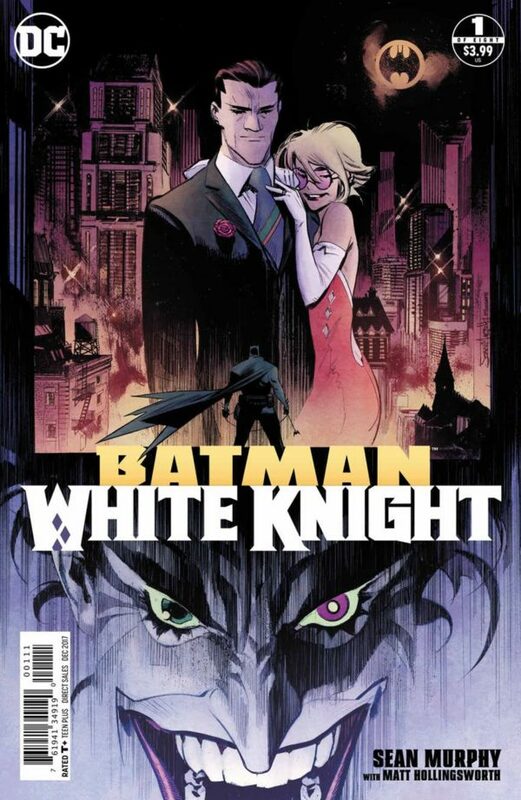 Sometimes you have to wonder what publishers or owners of iconic heroes think of this sort of criticism, Sean Gordon Murphy at DC goes all in and actively embraces this criticism to bring us the new 8 part series – Batman: White Knight. For those of you who don’t know, the premise of White Knight is simple. People realise how bad Batman is for Gotham, and the charges against him are lead by none other than his greatest nemesis – Jack Napier aka the Joker. He’s cured of his insanity and takes on Batman as Gotham’s White Knight, taking him on in obvious ways which Bats simply doesn’t see coming. The story opens with what feels like a fun tribute to Lego Batman – with the Joker trying to explore his relationship with a very reluctant Batman. The Joker is portrayed as Batman’s biggest fan, in a similar way to the outstanding Death of the Family series by Scott Snyder. 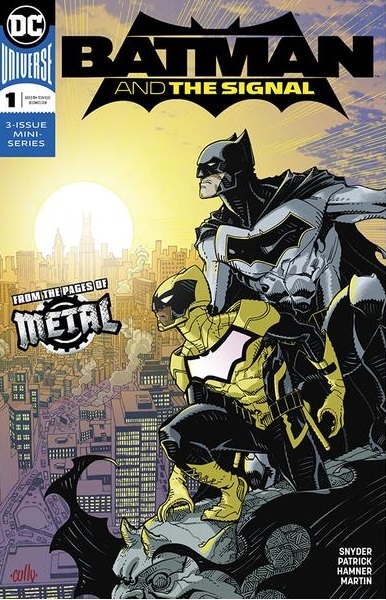 The first issue largely deals with world building, setting up the key plot threads and exploring what makes this Batman the person he is (outside of the usual dead parents, Bat obsession and grumpiness etc.). DC appears to have given Murphy all of the freedom to critique the Bat and vigilantism in general, with undertones of real world polarised political debate. Murphy took care of the art as well, this being his project and has set the bar very high across the board for himself. The art has a very cinematic feel to it, it feels like these could easily be the frames waiting to be put together for an animated film. Batman is drawn as a hugely imposing figure, there’s a particularly iconic panel early on where Batman and Jack Napier square off. The Bat comes off as monstrous, with Napier for once being calm and collected under pressure. The pale colour pallet used by Hollingsworth lends to a more down to earth feeling, where actions have consequences and people get hurt. Klein also has his work cut out for him with the lettering, there’s a lot of dialogue in parts of the issue and only so much page to fit it into. Klein manages to layout a dynamic format which keeps the reader engaged. How do both the Dark and White Knight’s hands check out though? Hands only feature so much in this issue, in places lettering or the limited space for panels leaves them squeeze out on occasion. Where they do exist however, a large amount of impact is packed into them. I’ll have to dock a couple of points for scarcity though! 8/10 for hand drawing skills! If any of you know the sort of comic I like, then it won’t come as a surprise that I really enjoyed this. 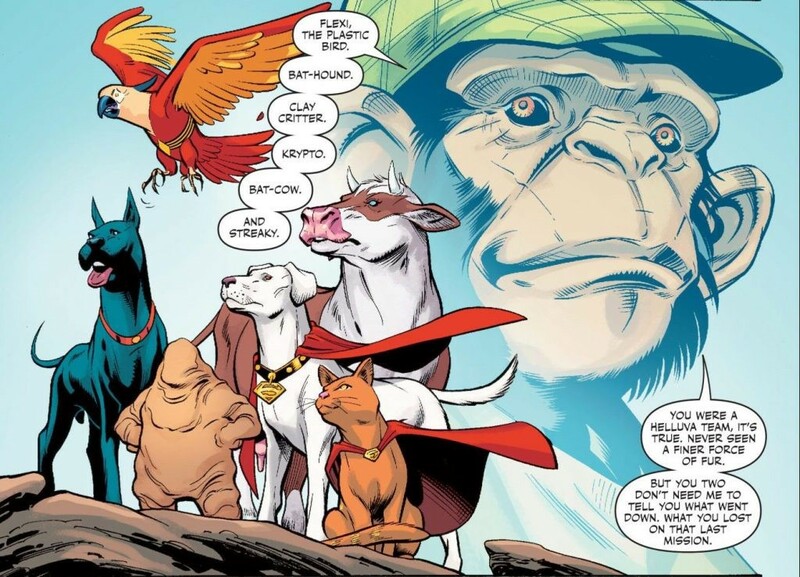 I’m excited to see where Murphy goes with the plot, though unfortunately I have seen promising comics slip up before. If Murphy can keep this up though, I doubt that’ll be the case. 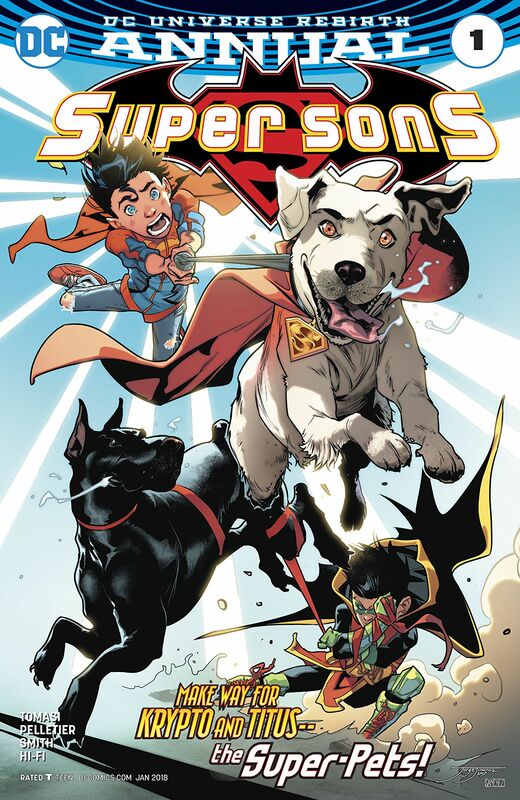 Posted on September 1, 2017 by thelostlighthouse	in Comics, Literature and tagged Apokolips, art, Batman, comic book review, comic books, Darkseid, Dave McCaig, DC comics, Jack Kirby, Literature, Mark Evanier, New Gods, Scott Kolins, TLL. For the centenary celebration of the birth of Jack Kirby DC are publishing a series of special edition comics for many of his most famous characters. Darkseid has always been one of DCs most iconic villains, on par with the likes of the Joker and Lex Luthor. What separates him from the others though – power. Of all the specials coming out this one appealed to me most. It also has a special OMAC short story and some classic stories written and drawn by Jack Kirby. 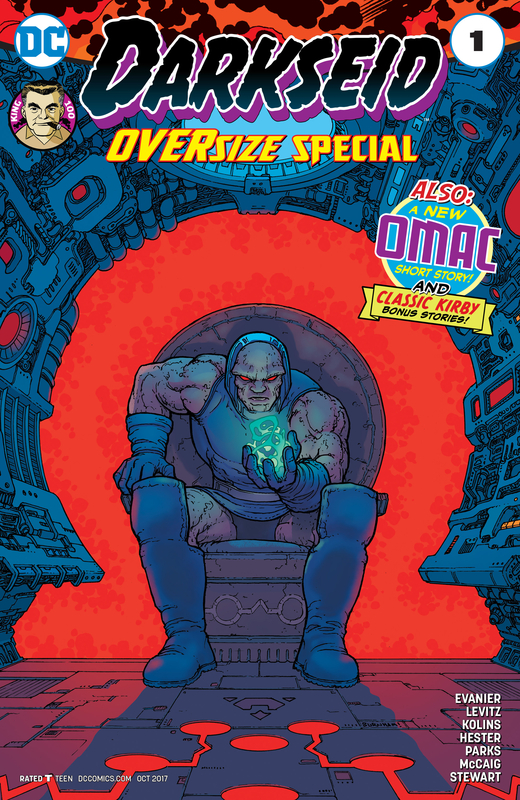 The comic is set entirely Apokolips, picking up the tale of ‘The Resistance’, three escapes who have dared deface one of the great statues of Darkseid, this is their story. Darkseid doesn’t make an appearance during the early pages of the comic, but even seeing the world through the perspective of our rebellious heroes is enough to give insight into Darkseid. His cruelty, power and inspired loyalty through fear are apparent throughout the entire landscape, environment and world of Apokolips. 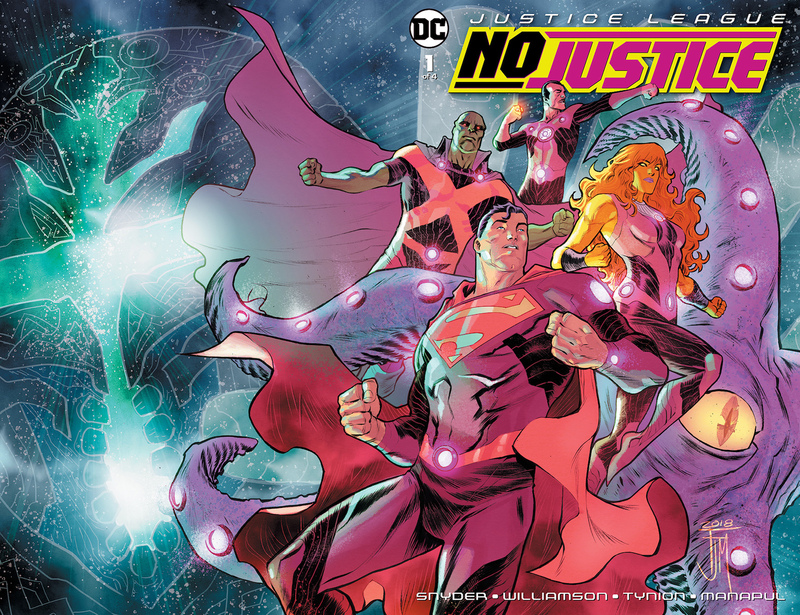 As the story develops, we see how Evanier manages to demonstrate both the in depth character development of each of the characters and the great, larger than life classic New Gods plot. There are cameos from the likes of Granny Goodness and the Furies who come across just as psychotic and monstrous as they have always been. 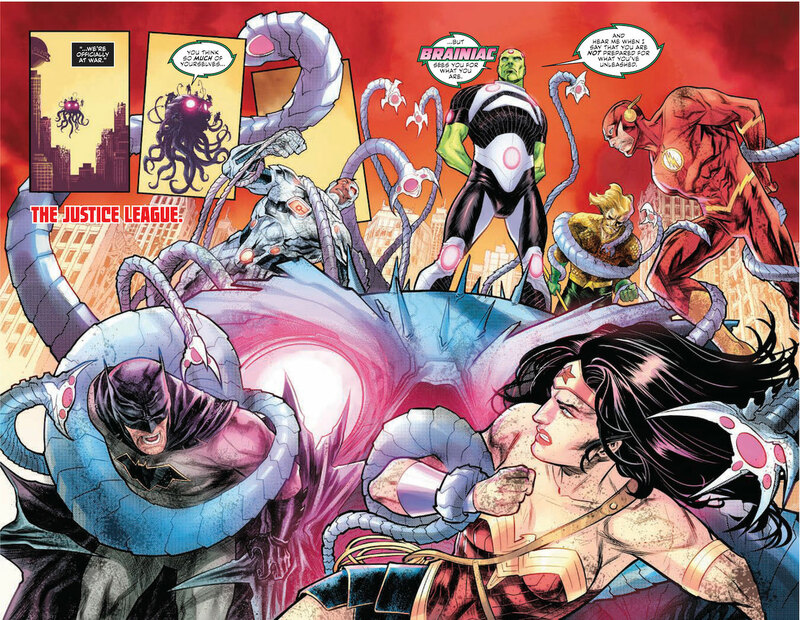 Kolins’ art perfectly communicates the dire situation on Apokolips. The pages are swamped with browns, reds and darker shades which simply makes the place look like hell under the hand of McCraig. The New Gods and Furies are larger than life and the emotion and desperation on the faces of the protagonists comes appears raw and human. Kolins and McCraig are both perfectly suited to the dark and gritty atmosphere in the comic. The question is though, can Kolins draw hands? There are a huge variety of hands, from those which tremble in terror to the gigantic mitts of Darkseid. Kolins and McCraig do great work with what they have in this comic, though we rarely see the characters reoccur too often to see the same hands in different situations. 8/10 for hand drawing skills! The special editions from Jack Kirby, which he both wrote and drew. They’re classic golden age comics with the surreal, larger than life story and simple, effective art. These themselves make the issue worth picking up.